FAQ – Questions and Answers - It's our europe! “It’s our Europe!” is a project which began in 2012 and is being continued in the period leading up to the 2014 European Elections. It is aimed at young people who want to show that they are interested in Europe, who would like to work on a specific topic and who are also prepared to assume responsibility for a united Europe. The exchange between young people from different countries is also important, particularly at time when Europe is faced by crisis and challenges, as it can help foster mutual understanding. What is the Ludwigsburg Initiative? Who is organising “It’s our Europe!”? The project is being organised by the Stadt Ludwigsburg and the Deutsch-Französisches Institut Ludwigsburg (dfi). The project is open to young people (pupils, trainees, students, members of an organisation) above the age of 15, who live in the European Union. We will accept multiple registrations from one organisation; group registration may be possible under certain circumstances. Be interested in working on one of the topics mobility through education; environment and sustainable development or participation and communication. Have basic knowledge of the EU’s political system and have an interest in the European elections. You can fill in the registration form online here, where you will also find the conditions of participation and other useful information. The closing date for registration is Friday November 22nd 2013. You will hear by the end of November 2013 if you have been chosen to take part. There will be three workshops, which will work on topics which came out of the Ludwigsburg initiative. The broad subjects are: Environment and sustainable development / Mobility through education / Participation and communication. 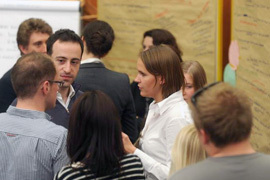 Within the workshops, you can discuss ideas and formulate proposals with the other participants. How will the online workshops be held? You will receive a user name and password from us, so that you can log in to a discussion forum on the website. This is where the online workshops will take place, and here you will also find further information on the topics. Each workshop will be led by a moderator. At the kick-off meeting, you will get to know the moderator and also find out how the work online takes place and how you can work together. Each participant will receive a certificate of attendance from us at the end of the project. All expenses will be paid by the organisers (Stadt Ludwigsburg, Deutsch-Französisches Institut) and the foundations and sponsors who are providing money for the project. There will be no cost to the participants! Who will pay the travelling expenses and costs for accommodation and meals incurred while attending the meetings? We are organising and paying for all transport accommodation, meals and any additional activities for everyone attending the meetings (For rail and air travel: 2nd class or economy tickets). Do I have to attend both events? The project starts with the kick-off meeting, and is intended to give the participants the chance to get to know one another and also the organisers and moderators, both factors important to the functioning of the project. There will also be information on and discussion about procedures and content. For these reasons, attendance at the kick-off meeting is essential! At the concluding event, representatives from each workshop will be chosen by the participants to attend and present the results to representatives from politics and the media. I am under 18, can I still take part? Yes, with the consent of your parents/guardian. They will have to sign a form to confirm that they know you are taking part and that they are in agreement. We will send you the form when you receive confirmation that you will be taking part. When registering, you should give us the name and address of your parents/guardian and confirm that you have informed them of your intention to take part. Can I take part with a friend? You can register individually with a note that you would like to work together. However, as we aim to have participants from as many countries as possible, we may have to make a selection from the registrations we receive. Which languages should I be able to speak or understand? If your first language is either English, French or German, then ideally you should be able speak at least another one of these three. If your first language is not one of these three, then you should be able to speak at least one of them well enough to take part in the online workshops and present your ideas and opinions. It is not a condition of participation that you can speak more than one of these languages. On the final day of the kick-off meeting, Wednesday 29th January 2014, we are organising various cultural activities, which you are warmly invited to attend. A tour of Ludwigsburg and the Palace of Ludwigsburg, and a visit to the Deutsch-Französisches Institut and its library are planned. These activities are optional. Who can I ask if I have any questions?